An industry record-breaking crowd of 17,000 is expected to attend the three-day MJBizCon that kicked off Wednesday morning in Las Vegas. 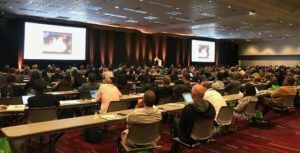 The conference, now in its sixth year, features 112 speakers and 678 exhibitors packed into over 100,000 net square feet of floor space at the Las Vegas Convention Center. Put on by Marijuana Business Daily‘s parent company, MJBizCon is expecting a major uptick in attendance over 2016, which drew over 10,000 industry executives from around the globe. Attendees are expected from all 50 states, as well as from 44 countries outside the United States, including such far-flung destinations as Kuwait, Hong Kong and Sri Lanka. “MJBizCon’s new home at the Las Vegas Convention Center provides a terrific backdrop for the industry to showcase how much it has developed in the past year, and over the past five years since the event launched,” said Cassandra Farrington, CEO of Marijuana Business Daily. George Blankenship, the marketing mind behind Tesla, Apple Stores and the Gap. Dot-com venture capital veteran Jeanne Sullivan. Kenneth Walsh, who has covered the White House for over 30 years for U.S. News & World Report. Chris Walsh, the vice president of editorial and strategic development for Marijuana Business Daily. The show also features panels of experts discussing ranging from cultivation to business insights regarding one of the newest and hottest cannabis markets in the world, Canada, which is poised to legalize recreational cannabis at the national level next year. The conference is taking place in Nevada just months after the state launched a recreational industry and only six weeks before California begins regulating adult-use and medical marijuana markets – further reminders of how quickly the cannabis trade at large is growing. My experience from last year. A lot of people with no mj business experience. They go to the after parties for the nose candy. Hope it’s not the nose candy of the1980s. Is there any way to access a stream to the conference? Hi, Robert. Sadly, there is no livestream. You can, however, check out highlights by clicking here. I find a lot of folks in the green rush just because it has great financial possibilities. These are the same folks who denounced the cannabis community as a “bunch of stoned pot heads”. Now they are gearing up to make money off of the same folks. Many folks at the fairs/shows I have been to have no cannabis experience whatsoever. It only takes a couple of questions to really find out if they understand cannabis OR they are just trying to make money from “pot heads”. Many folks are out there just to make money, they know nothing about the industry or the consumers. Vegas, cannabis, Nevada rec market looming…hey whats not to like about this one.